Happy New Year to everyone!!! It is hard to believe. I feel as though 2013 sped by at warp speed. I thought I would start the year off on the right blogging foot with a new post. I am hoping to be a much better blogger this year. I seemed to be content with creepy lurking last year. 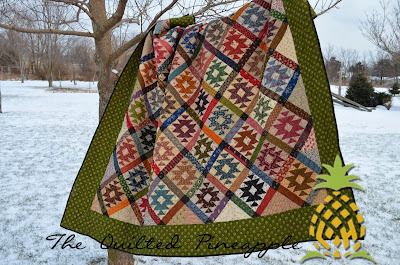 I quilted, bound and washed Rocky Mountain Puzzle available here, which was the 2012 Summer Block of the Week from Primitive Gatherings. 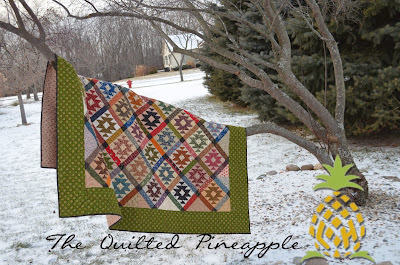 Confession time...I have never completed a block of the month type quilt EVER. Oh, I have signed up for a few of them over the years, but I always lose interest after a few months. So this was a huge milestone for me. I showed the completed top here and changes I made from the original pattern. And now!! The quilting is an allover freehand feather. Different than one I have done before. 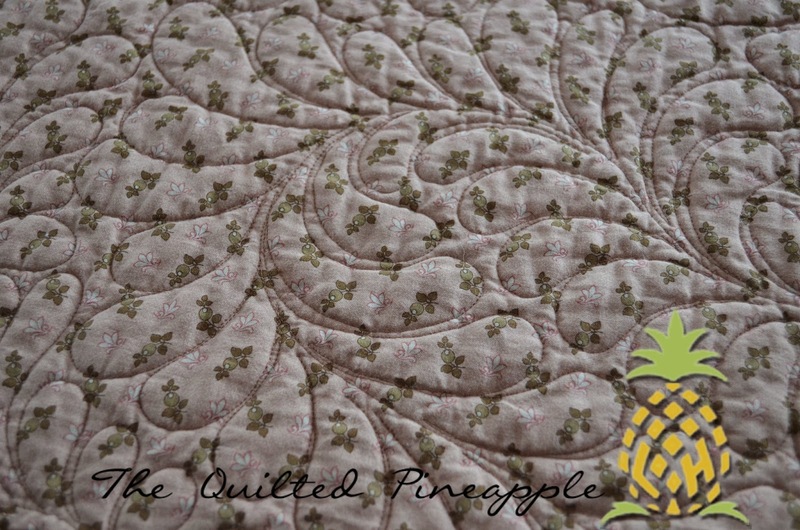 My quilt was a practice piece, as it was the first time I quilted this design out. This feather is more casual I guess for lack of a better term. I would consider the other style more of an heirloom feather. This design quilts out much faster than the other. Perfect for an allover on a quilt. I used Dream Wool Batting. You can really see the texture!! Actually there are probably 12 pieces of batting in there!! I used odds and ends I had in the cupboard. 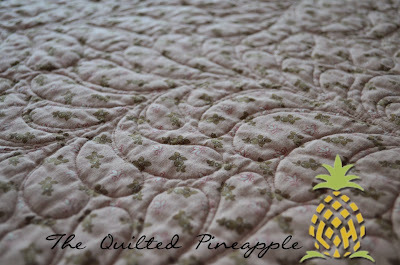 You can see how a wash and dry makes the quilt all crinkly and wonderful. Yes, I dried my quilt. Dried it until it was crispy. No major shrinkage. I like to torture my quilts a little. :-) No issues with the pieced batting either. This way I can give honest answers if a client asks about washing and drying quilts or wool batting. And this quilt has already received plenty of love by the time I took these photos. And a few of the back. Very nice - and thank you for sharing the details! I read that it is a freehand all-over pattern, but I have found that means different things according to who you talk with.....I am curious did you use a pantograph? If so, I would like to know where I can get one......again thanks for sharing and Happy New Year! Good for you for taking the time to work on your own projects! Also, I appreciate the time you spent in the cold for the great pictures. 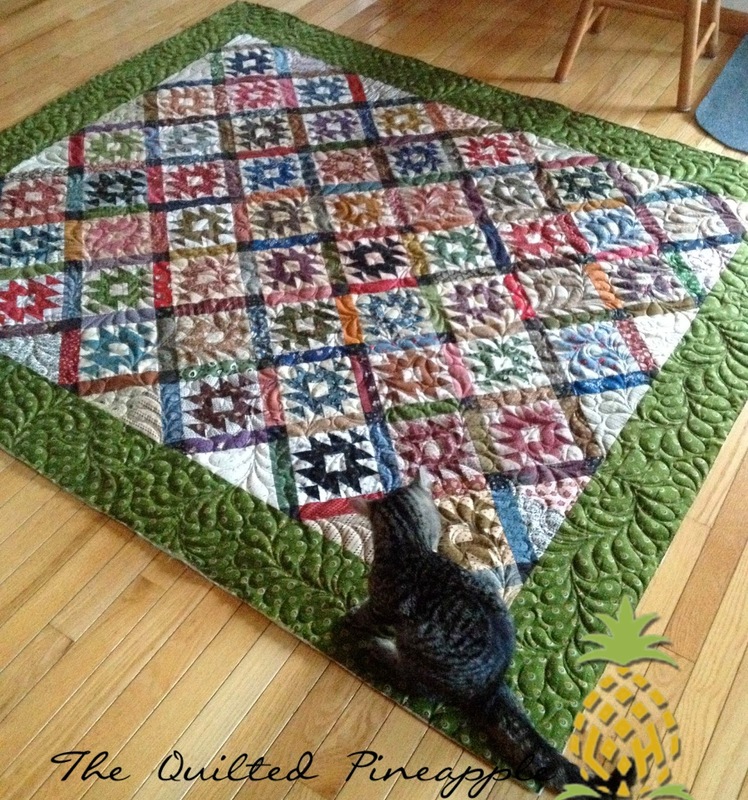 It is such a lovely quilt! 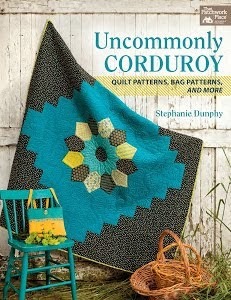 Beautiful quilt and designs, enjoy seeing the process and details. It looks wonderful photographed outside, against the snow. I'm sorry that you were freezing while taking outdoor pictures of Southfork, but for all of your readers... it was so worth it! It's beautiful... and congrats on the 26 finishes! Love this quilt and how you have quilted it. And thanks for braving the cold. The photo in the tree is wonderful. Hoping foot recovery is going well. It is also looking like l might take the path of foot surgery this year and would love to hear more about what you had and your recovery. It looks as though Louie is trying to work out the puzzle. I adore that quilt. When I saw it the first time you showed it I went over to PG and bought the pattern, along with the pattern for last years pieced block of the week. I will not miss out again this year if they have one. I have my blocks all finished ready to set. I really like your border. Do you mind if I ask how wide your border is? That green is perfect! 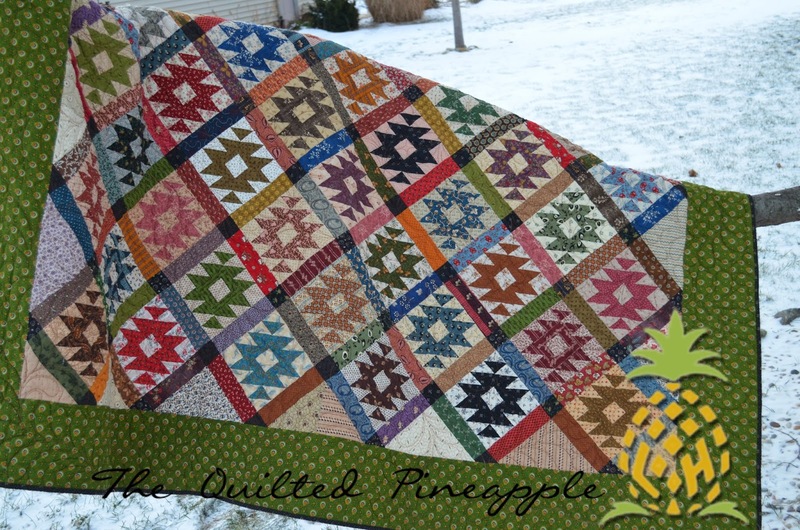 This looks beautiful in every way...the pattern, the fabrics, your piecing, the stunning quilting and the amazing snow...you must be thrilled! Great way to start the new year!! It's beautiful! 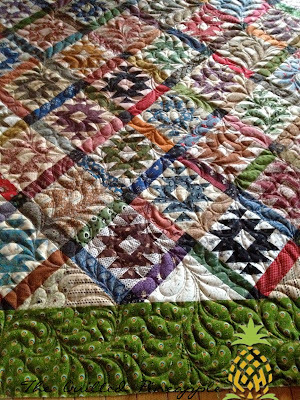 The green border really sets this quilt off. I love all the scrappiness in the blocks. 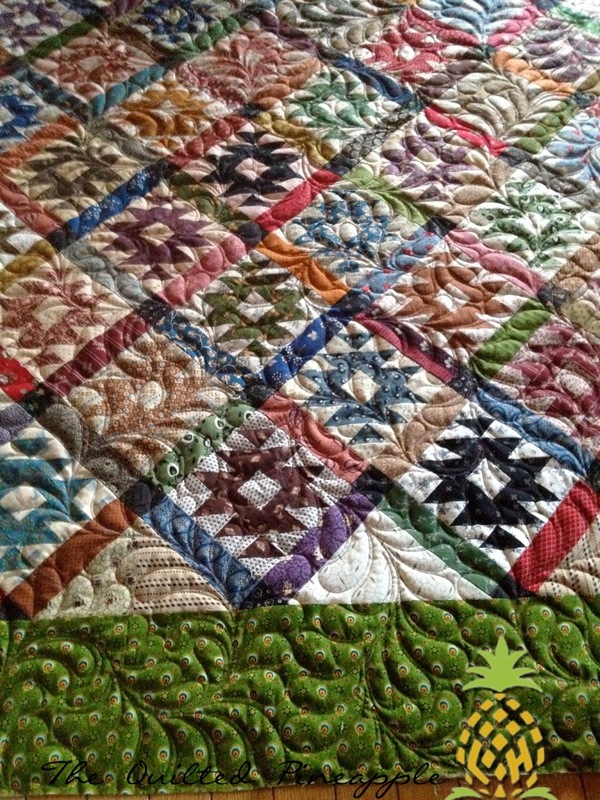 This is a beautiful quilt and beautiful feathers! I'm impressed you finished so many projects! I'm the same way - never finish a BOM so happy you did it! Question for you about batting, what do you do with all your extra pieces? I've got batting coming out of my ears! But I can't bare to throw it away. Do you piece it together - or just throw them in your quilt? Would love to know. Happy New Year! Absolutely beautiful! 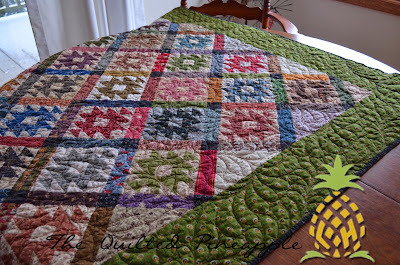 I do love the green you chose for the border.... and the all over feather is just perfect! I still have this in it's little bags as received at the time the Block of the Week happened... 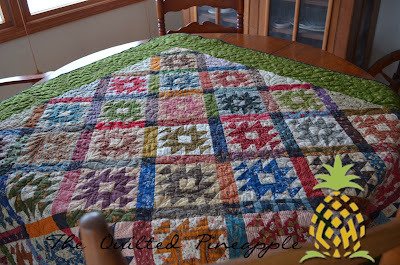 I'm hoping to have it pieced by February.... or at least by the time 2014's Block of the Week starts! lol! 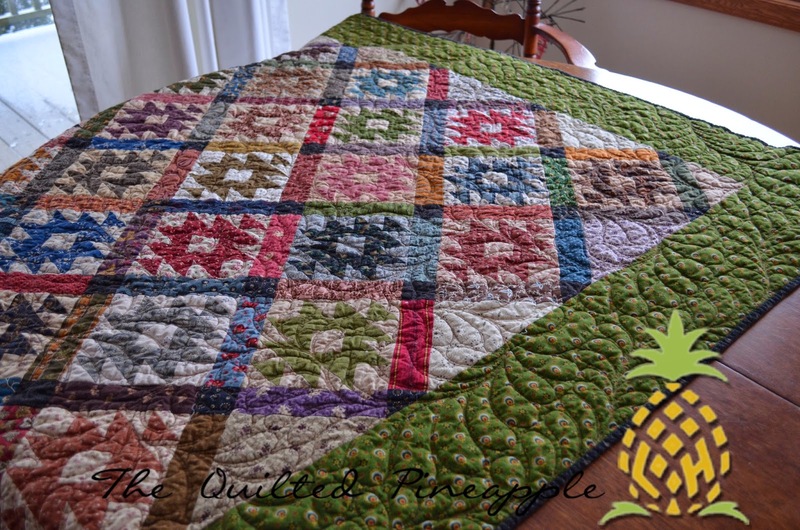 Your quilt and quilting is beautiful! 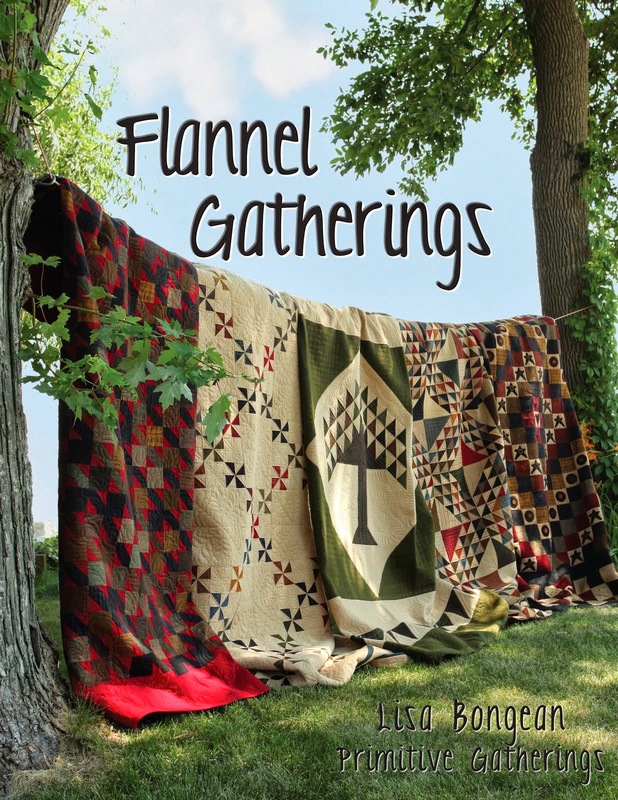 You mention wool batting (I agree it is wonderful) in allot of the quilts. 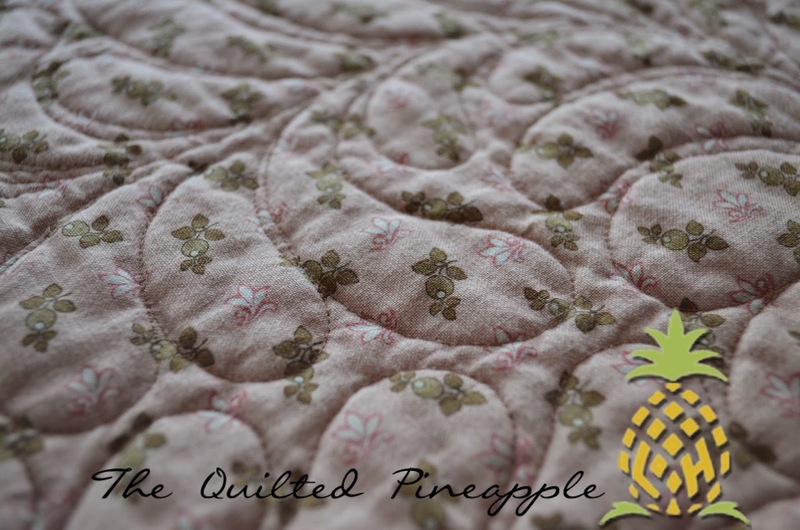 Do you make it a standard in customers quilts as well or just yours? Sometimes it's best to take doctor's orders! 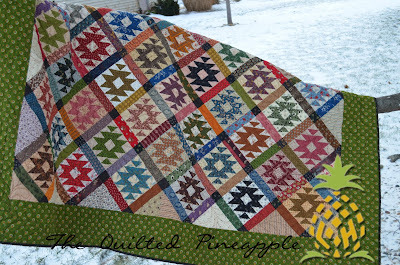 That is gorgeous and I love quilt/snow photos. 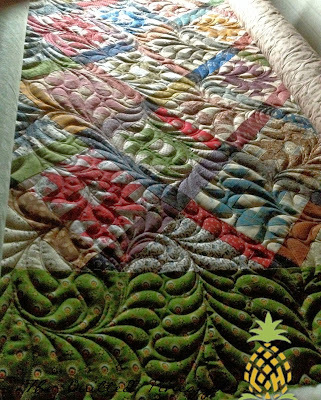 I always feel I can reach and and touch your quilts as the texture of your quilting is to lovely. I love how you share your tips with batting, piecing, washing, etc...so helpful. I am not a BOM girl...I think I just get too bored with the amount of times it stretches in to. I make a good effort then fall off the wagon. Happy New Year!!! Beautiful as always Linda! I love the green border. Take good care and Happy New Year to you and your family. I LOVE that quilt and you did a wonderful job making it to the finish line!! I'm like you most of the time, pooping out halfway through and never finishing. 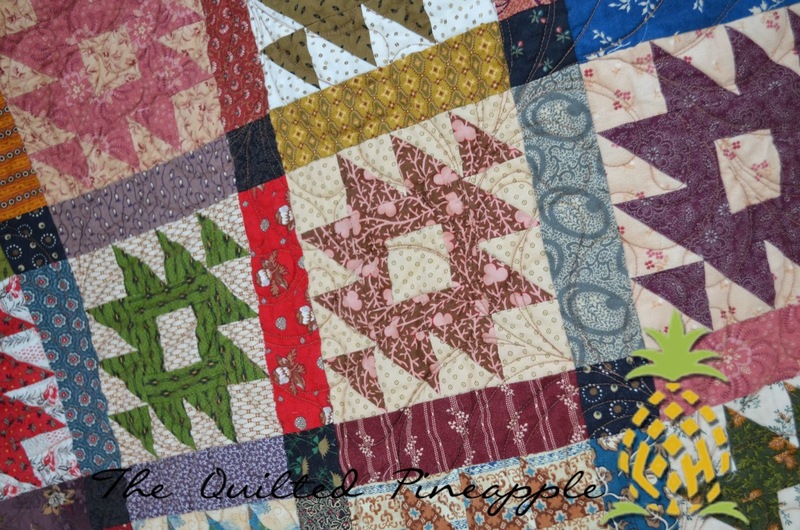 Your quilting is ALWAYS gorgeous. Beautiful quilt and quilting. 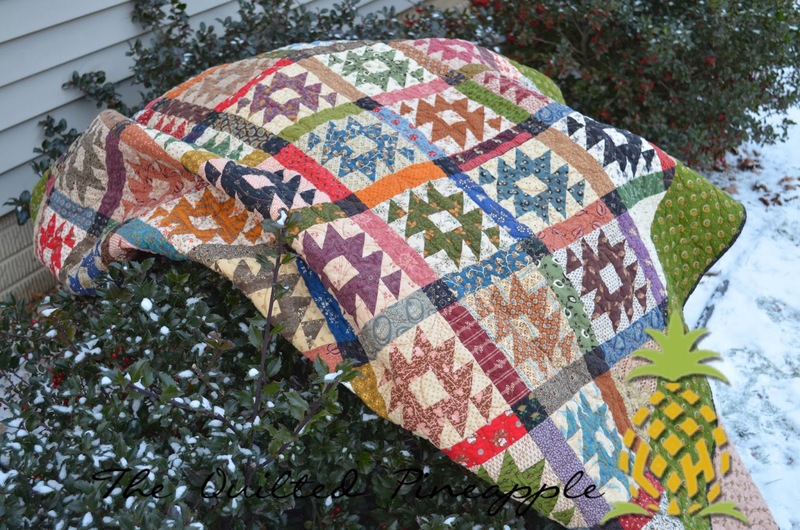 I too, always love pics of quilts taken outside. The effect is awesome. Congrats on completing 26 projects. You are such an inspiration to all quilters. Always love seeing your work. I love the juxtaposition of the Civil War block and the bright colors. That is a gorgeous quilt! Congratulations on all you accomplishments in 2013. 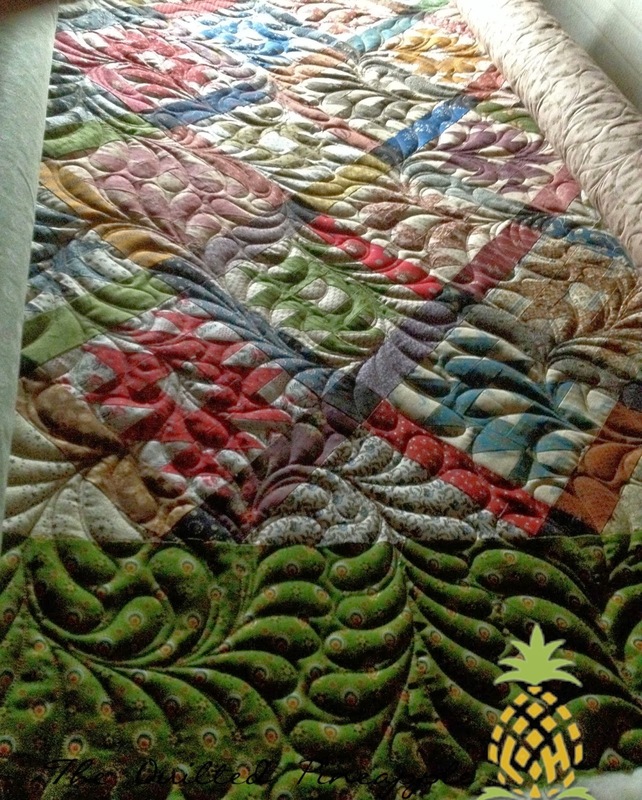 I love the quilt and I especially love the free-form feather quilting. Just beautiful, as are the photos outside. Now that I live in an apartment house, I really miss a clothesline, for more than hanging laundry. Love your feathers! I was practicing on my whiteboard yesterday and mine looked like strange trees LOL! I love, love, love your work :-) speaking of trees your outdoor pictures are beautiful! I especially like the ones with the trees. Your quilting is just amazing. 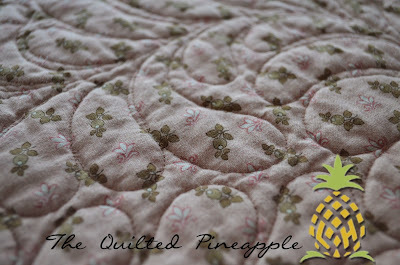 I pinned a photo the other day and after a closer look it was one that you had quilted. 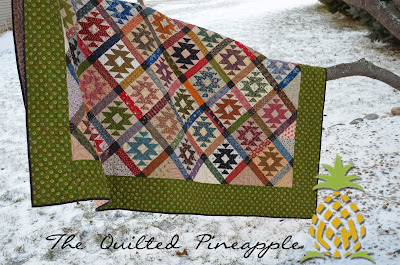 Happy New Year to you filled with lots of quilting hours! Do you know Linda, I remember when you first got your long arm machine... this post of your quilting is gob-smacking beautiful. Stunning... and much love to girls... are they quilting yet? Oh, I'm just speechless: I got your blog address from Tamarack Shack blog and now sitting here an browsing your fabulous quilts and quilting!